The figure may be lebelled as shown. The triangles composed of three components each are BCD, CDE, BED, and BCE i.e. 4 in number. We may lebel the figure as shown. 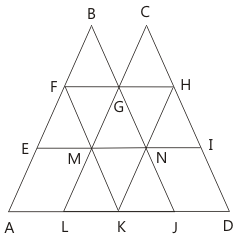 The simplest triangles are BFG, CGH, EFM, FMG, GMN, GHN, HNI, LMK, MNK and KNJ i.e. 10 in number. The triangles composed of three components each are FAK and HKD i.e. 2 in number. 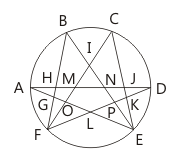 The triangles composed of four components each are BEN, CMI, GLJ and FHK i.e. 4 in number. The triangles composed of eight components each are BAJ and CLD i.e. 2 in number. Thus, there are 10 + 2 + 4 + 2 = 18 triangles in the given figure. We may label the figure as shown. Thus, there are 7 + 8 + 4 + 2 + 3 + 4 = 28 triangles in the figure. 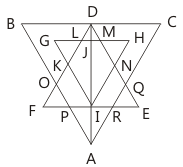 The simplest triangles are GLK, DLJ, DJM, HMN, QRE, IRA, IPA and FPO i.e. 8 in number. The triangle having two components each are BDO, CDQ, DLM, PRA, KFI, NEI, HJI, GJI, DKI and DNI i.e. 10 in number. The triangles having four components each are DIE, DFI, DOA, DQA and GHI i.e. 5 in number. The triangles having six components each are DCA and DBA i.e. 2 in number. DEF is the only triangle having eight components. 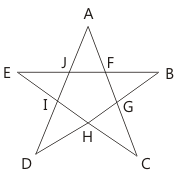 ABC is the only triangle having twelve components. Thus, there are 8 + 10 + 5 + 2 + 1 + 1 =27 triangles in the figure. Mirror Image Problems for SSC CHSL, CGL Tier 1 Click Here..
Pattern Completion for SSC CHSL, CGL Tier 1 Click Here..
Paper Folding and Cutting for SSC CHSL, CGL Tier 1 Click Here..